Budding stayer Shampion finished 2017 with a bang for trainer Danny O'Brien and owner Jeff Dimery. The daughter of O'Reilly was dominant in her win over 3000m at Warrnambool, coming from back in the field to win drawing away for apprentice jockey Taylor Marshall. 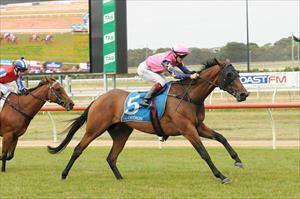 "It was a very strong win, and a very good ride by Taylor. She just loves getting out over a trip," O'Brien said. "She is no Shamrocker, but she will make a lovely broodmare when her career finishes," the trainer said in reference to the dual Group 1 winning filly he trained for Dimery that Shampion is closely related to. "And she has a few more win in her too." Sunday's win was her fourth, with all her wins being beyond 2200m, from 25 starts which includes seven placings and stakes of more than $90,000.